Its is a robot config with 5 DOF. We are provided 2 offsets d1 and d2. d1 and d2 are both 0.04 meter. It is confusing for me alittle bit. 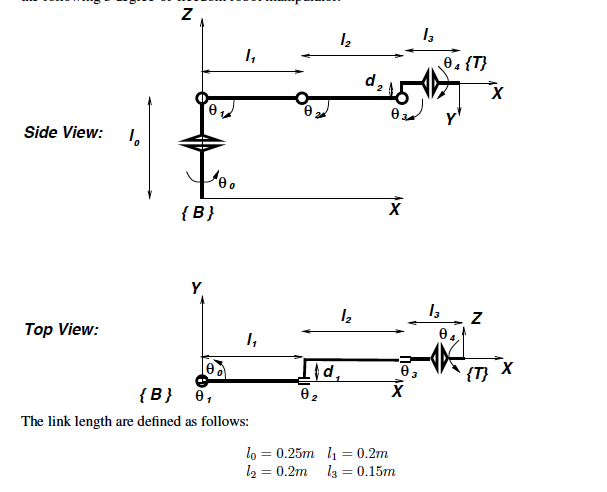 I am attending lectures online but I am having trouble figuring out the angle joint configs and their mappings. Is there a simulation software I can use to visualize and understand its parameters. His code is fully downloadable. To explain my answer, Mr. Annin built an open source 6 axis robot! he explained how he achieved his inverse kinematics in the video I linked to, and the excel file he uses, is available to download. Like I said, Mr Annin is a beauty. Surprisingly, IK for a 5DOF robot arm is much harder than for a 6DOF arm. The reason is because a 5DOF arm cannot achieve an arbitrary pose in task space. Pose is typically expressed in terms of a 4x4 homogeneous transformation matrix ($\in SO(3)$) which encodes position (3 task-space DOF) and orientation (3 task-space DOF). To solve IK for your 5DOF robot you need to decide which task-space DOF you don't care about. For example you can compute IK that will take the end-effector to the desired position, and perhaps a desired roll and pitch angle, but you have no control over the yaw angle. I tried to explain this at greater length with examples in a tutorial for the 4DOF case. Not the answer you're looking for? Browse other questions tagged inverse-kinematics mapping or ask your own question. Inverse kinematics: how to specify TCP constraints in an iterative algorithm?